That great big church at the top of Ludgate Hill in that there London was last forced to close its doors in 1942 due to the attentions of the Luftwaffe. Now, tents and banners are considered as threatening as Dorniers and Heinkels. St Paul’s is no stranger to closure. Prior to the London Blitz, the first cathedral was destroyed when Mellitus, the first Bishop of London, failed to convert enough pagan Anglo Saxons in the early seventh century. The second cathedral was destroyed by fire in 962 and the third burnt down in 1087. St Paul’s number four was badly damaged by fire in 1136, plundered by Henry VIII during the Dissolution of the Monasteries and the spire was struck by lightening and destroyed in 1561. With a bit of a pattern emerging, “Old St Paul’s” finally burnt down in the 1666 Great Fire of London. The current masterpiece by Christopher Wren was consecrated in 1708 and mercifully remained unmolested until a bloody big time-delayed bomb embedded itself into the building in 1940. Fortunately, the bomb was defused but other incendiary devices continued to rain down on St Paul’s. It seems odd then, that this latest closure of the cathedral has come about due to concerns over health and safety. In 1940, 500 pounds of high explosives lodged in the transept did not stop worship, but now, acoustic guitars, beards and the occasional pair of flip-flops threatens the very fabric of heaven and earth. The Occupy campaign, in case you hadn’t noticed, has gone global. In 1,000 cities across the world, people are staging peaceful protests against the plundering of the planet by the very wealthy few at the expense of the very many poor. Some nervous governments have reacted with tear gas, baton charges and mass arrests in spite of the fact that the occupations are passive and well within the law of each sovereign state. Within the ranks of political apparatchiks in the pay of the powerful rich, there is growing foreboding that these protests are not going to go away. Here in merry England and the once great Britain, our gentlemen’s gentlemen in the coalition are happy to allow unscrupulous rich people to become richer and bash anyone over the head who dares to object to the fact that the poor are becoming poorer. Unfortunately, some of the kettled and bruised young people have reasonably well off mummies and daddies who usually vote for the valets of market forces and might just stop donating to the below stairs Christmas party fund. Clearly, a new tactic is needed. 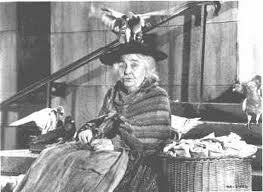 The days of impoverished old ladies selling bird seed on the steps of St Paul’s have long gone. Actively encouraging the attraction of vermin, these vagrants and scroungers needed to be moved on in order to secure the health and safety of worshippers during Matins and Evensong. Having rid the City of London of this curse, the pigeons mysteriously remain and the incendiary bombs have become less frequent. At the start of the Occupy the London Stock Exchange protest, the authorities at St Paul’s stated that they respected the right to peaceful protest and worked with the demonstrators to allow them to pitch camp. Realising that bashing legitimate demonstrators over the head had failed, the government, the press and the lunatic back benchers in cloud cuckoo land started the name-calling. Feckless anarchist youth, scroungers, deficit denying scum, unwashed morons and, the ultimate put down, anti-capitalists were offending God. Time to evoke the Health and Safety at Work Act 1974. The cathedral closed, citing concerns over sanitation and access to the emergency services even thought the protesters had in place all the tick-box requirements for a legal demonstration, even designating an overspill site for people joining the protest. So what made the good clergy of St Paul’s change their minds about a welcome to the poor and dispossessed? Some terribly cynical people have suggested that tourists will not visit Wren’s masterpiece because of threats of violence from anarchists and will thus deprive the church of much needed income. At £14.50 for an adult and £5.50 for a child, that is an awful lot of income. Closing the big place means zero income and prayers being offered behind closed doors. A few robed canons does not help God’s business plan as the church needs the tourist buck, euro and yen. Others, even more gullible, have dared to voice an opinion that the government has put pressure on the Church of England to evict these embarrassing purveyors of bird seed and tell them to get a job. Sadly, there are no jobs to be had, even for the young graduates who actually like capitalism but don’t like the corporate greed that rewards the wicked and punishes the virtuous. All around the cathedral, the Saints and Apostles, look down as they sell their wares. The right wing press found themselves in a dilemma. After years and years of “health and safety gone mad” headlines, they now give us stories of a bride who had to enter the cathedral through a side door to be married. The bride has to be safe on the most important day of her life. She smiled serenely and seemed to enjoy the attention of the six television news crews and the cheering protesters at the closed front door. Instead of headlines denouncing red tape, we were given headlines describing a big day ruined by anarchists. The temporary closure of St Paul`s received an extraordinary amount of media attention in stark contrast to the permenant closure of care homes for impoverished old ladies who once sold bird seed. In more ways than one, for the bride and “city worker” groom, who probably spent more on the cost of the ceremony than the price of a house for less elevated newly-weds, it was a day to remember. The Church of England seems to have a problem in conducting risk assessments. Turning to scripture is no help as there is no mention in either testament of reducing the risk of a money lender being injured during the over-turning of tables in a temple or how to manage the hazard of sitting on a cloud playing a harp or what to do when the Protestants and Catholics kick off once inside the pearly gates. The Health and Safety Executive would not be best pleased with the form being filled in with “It is God’s will” against every control measure of risk. A spoonful of sugar will help the alleged medicine of austerity go down when a tiny minority of bankers and millionaires continue to benefit from the misery of billions of people. If you happen to be walking on Ludgate Hill, buy a bag of bird seed, a loaf, a four pack of lager, a phone top up, some cheese and maybe a bottle of propane for the young people who are peacefully saying that we have had enough. Or just give them tuppence. And maybe sing them this cheerful song. After an Arab Spring, perhaps there will be a Bankers Fall, or Autumn as we say on this side of the pond. Let us hope that the peaceful protesters all around the world do not get their hands on AK47s, rocket launchers, canon, tanks or a misguided notion that violence makes it right. If not, then we can all go fly a kite. Lawks a mercy, Mary Poppins. William Hague is pleased, David Cameron is proud and the ever erudite Hillary Clinton reacted by saying “wow”. Gaddafi is dead and Libya is now free and at peace. God, it seems, is great. Colonel Muammar Gaddafi, brotherly leader and guide of the first of September revolution of the Socialist People’s Libyan Arab Jamahiriya, King of African Kings was a very nasty piece of work and not many tears will be shed at the news of his passing. The evil madman lived by the sword and died, it would seem, by a mixture of drone technology and a 9mm bullet to the head. The details of the death of the tyrant are still vague but it is worth pointing out, particularly to Foreign Secretary Hague, that the death occurred on Libyan soil and that the drainage pipe was not located in Venezuela. It’s called intelligence, William. It does not bode well that the first faltering steps to democracy in the Magreb were taken by dragging a human being from a sewer and dispatching him to heavenly paradise with a cartridge probably manufactured in northern Europe or the United States. The ghoulish feeding frenzy in the western media has not helped either. Television news outlets screened shaky mobile phone footage of the very bad man’s last moments, helpfully freeze framing to show his face. Certain sections of the printed press took orgasmic delight in running full page images of the dictator with his brains on the pavement. It was either that or front page spreads reporting on Westlife splitting up. 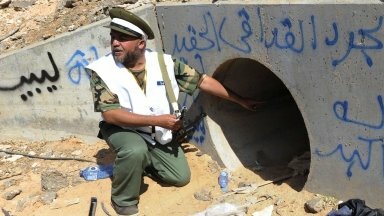 Gaddafi dying in or near to a sewer is both ironic and convenient. The bad guy threatened to hunt down “like rats” any of his own people who dared to defy him and probably regretted not outsourcing vermin control to Rentokill. Now mercifully silent, the mad dog of north Africa will not be allowed to bring embarrassing revelations to something called, in a world long gone, a trial. A succession of western leaders will breathe a huge sigh of relief that the smoking gun was unloaded into the strange mind of the brotherly leader thus avoiding unnecessary and rather embarrassing legal proceedings. They have no wish to see a repeat of expensive and lengthy litigation against Balkan despots feigning terminal illness or the absurd theatre of Hosni Mubarak turning up in court on a hospital trolley. Only a year ago, Gaddafi was still considered as a friend to the west, but only because he was sitting on massive oil reserves. Blair, Brown, Cameron and their predecessors will be delighted that justice and silence came from a 9mm shell and that Muammar has joined Osama in paradise without the small detail of having to answer for their crimes. Should the world be thrown into a crisis regarding a shortage of falafel from Syria, or cous cous from Yemen, then we can be sure that our leaders will launch air strikes to protect the people of those nations as long as they agree to buy armaments from us after the tyrants have met their fate in a sewer. We will celebrate with the scary, shouting men in Nike and Adidas football shirts who fire AK47s into the air stating that power must not come the the muzzle of a gun. The rag tag army that toppled a dictator are thanking us and are already arguing about who should rule. Far from welcoming the first full revolution of the Arab spring, we should consider just who we have armed to protect our unhealthy interest in oil. Replacing one barmy dictator with another might be good for the price and availability of crude but it will not stop rats from entering the kitchen. It is only a matter of months since the leaders of the National Transitional Council enjoyed a lavish life style thanks to the munificence of the King of African kings. It is at best uncomfortable to realise that we have defended and encouraged the freedom and the right to drag a man through the streets and then shoot him. Cameron might be proud, Hague might be pleased and Blair will be relieved. Rats don’t just live in sewers. In the film Bambi, Thumper the rabbit recites the advice given to him by his father: “If you can’t say something nice, don’t say nothin` at all.” With Brer Fox no longer Defence Secretary, it would seem that Thumper`s dad is in charge of government spin. Within seconds of Brer Fox announcing an inevitable return to the back benches, all manner of coalition apologists were in front of microphones howling the praises of the sly old dog with sophistry usually reserved for eulogising Churchill or the Duke of Wellington. Without Dr Liam manning the barricades, the suggestion is that our shores are now defenceless. One particular bone-headed Tory described the resignation as harming the national interest. No reason has been given as to why the Fox has gone to ground. For that, we will have to wait for Brer Gus MacDonald to mix up a bucket of whitewash and paint the hen house. The days of politicians resigning after some sordid misdemeanour are long gone, the expenses scandal saw to that. Consider Brer Danny Alexander dodging Capital Gains Tax, or Brer Gove acting unlawfully over BSF, Brer Huhne blaming his ex for a motoring offence and now Brer Letwin dumping all that sensitive yet heavy paper in St James`s Park. The law that governs the rest of us is obviously a minor irritation that is of no concern to those that govern the law. It is, of course, expected of cabinet ministers with an overwhelming parliamentary majority to display a contemptuous arrogance towards the common herd and for MPs with safe seats to do stupid things. It is worth, then, remembering that this coalition was not actually elected and with more and more hygienic voters joining the great unwashed in taking to the streets, no seat is safe. There is a long dishonourable tradition amongst honourable members of only resigning once they have been found out and any attempt at a cover-up is doomed to failure. In these more enlightened times, our elected representatives tend to dispense with this legal nicety. John Profumo, Reginald Maudling and even Jeremy Thorpe would, judging by today’s double standards, retain seats in cabinet. A hand in the till or another body part inside another human being seems to be de rigueur for a position of power. With the ritual humiliation of the simple minded being broadcast nightly on television and outraged newspapers running headlines like, “Singer’s lewd and offensive performance – more pictures on page five”, surely we can forgive the occasional indiscretion from those that rule us. Given this laissez faire background, when one of the Brers actually resigns, you know that something serious is going on. David Laws, sadly not in government long enough to be considered a Brer, did the decent thing after some unpleasantness involving rent. Within seconds the talking heads were in front of microphones describing him as the greatest Chief Secretary to the Treasury that had ever drew breath and that he should return to cabinet as soon as possible. The former investment banker worked for those paragons of virtue JP Morgan and Barclays de Zoete Wedd and is credited with forming coalition fiscal policy. With only three weeks in office before resigning, just imagine what he could have achieved for investment banking if he had remained in cabinet for the last 18 months. The same nonsense about the early return of Brer Fox is being barked by the likes of John Redwood who fears that the resignation will embolden an opportunistic anschluss of the UK by the bad people in Europe. After a week of being trailed, the hounds are closing in on Reynard for, as yet, undisclosed errors of judgement and the Dutch courage of resignation may yet avert further scrutiny of his dealings with best man Werritty and goodness knows what else. The record of the Defence Secretary is, indeed, impeccable. Nimrod gone, Harrier gone, Ark Royal gone, Leuchars Tornado gone, new aircraft carriers with no aircraft, Merlin outsourced and front line soldiers dodging bullets and road side IEDs in Afghanistan being told of their redundancy by text message. His Strategic Defence and Security Review certainly helped protect bonuses for bankers and his successful meetings with anyone with a bank account healthy enough to pay for weapons of death and destruction procured from BAE Systems or General Dynamic UK has increased the export of UK armaments. It is economic genius to sell weaponry to Gaddafi, bomb it and then charge the new interim government of Libya to replace it. Such entrepreneurial flair will not be easy to match so a simple mea culpa will probably result in the hounds being sent back to their kennels and the collateral damage to innocent civilians around the world allowed to continue as business as usual. 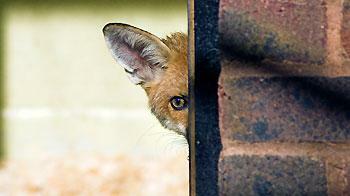 After all, with Bambi’s mum lying dead, it wasn’t Brer Fox that sold the hunter the snipers rifle. It might be best for him to lie low and say nothing. We are all frightened of something. It could be the dentist, the dark, snakes, spiders or the bogey man hiding under the bed. 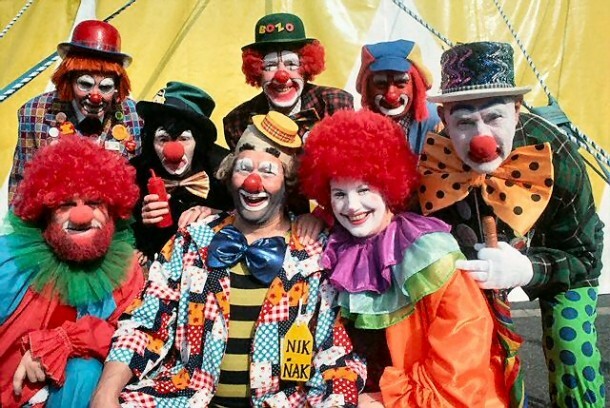 But for true terror we need only observe the clowns that claim to rule this sorry nation. After almost 18 months of making us laugh with their knock-about jolly japes, hilarious slapstick and farcical policies doomed to failure, the Whitefaces, Augustes, Pierrots and Pierettes are finally showing their true, sinister colours. Those that sufferer from coulrophobia may wish to escape this superposition by sealing themselves into a steel chamber with only a Geiger counter attached to a sturdy hammer, a very small radioactive isotope and a flask of hydrocyanic acid for company. Being simultaneously dead and alive, it would seem that the coalition have killed the cat. So the Conservatives headed off to the city that had previously hosted the Peterloo Massacre in 1819, the first meeting of the Trades Union Congress in 1868 and lots of people helping themselves to trainers a few months ago. Manchester, known as “Cottonopolis” during the Industrial Revolution, witnessed the first splitting of an atom and the first programmable computer but is now better known for multi-millionaire whoring, ugly footballers and equally rich and ugly players who refuse to play. Add to this the spectacle of the Tory comedy charabanc being driven into the circus ring and having all the doors, wheels and passengers fall off accompanied by a puff of smoke, and Manchester is clearly the place for a good rib-tickling laugh. Up jumped Biffo Pickles, a clown that does not require grotesque make-up, to talk about curtailing “ridiculous” trade union rights in local authorities and the the importance of moving on itinerant travellers. His “refuge” (his word) initiative is likely to result in more wheelie bin related cat incarcerations. Then another whey-faced loon, Bozo Gove did a comedy song and dance praising his paymaster, the very frightening Rupert Murdoch. Ozzy the Chancellor clown did a stand up routine about “credit easing” for small businesses. With debt being the single biggest threat to the very fabric of the universe, he offered the vague notion of small businesses borrowing money from the government and so be in debt to the government rather than the puppet master bankers. There is obviously profit to be had from debt. The present government has not reduced the level of borrowing that brought us to this sorry state of affairs which, until just a few weeks ago, was the singular fault of Gordon Brown. Now it seems that “global conditions” are the reason we are all shopping at Poundland and eating oven chips. Ozzy made no mention of this or an economy at a standstill and about to go into reverse or his instruction to the Bank of England to inject a further £75billion of printed money to avoid the custard pie of insolvency. In 2009, from the safety of opposition, Ozzy said that quantitative easing, printing money to you and me, was “the last resort of desperate governments when all other policies have failed”. Plan A is a strategy to protect the pathetic reputation of a man that has never done an honest days work in his privileged life. The laughs continued. Planning controls in the green belt are to be relaxed, health and safety legislation is “ridiculous” and will be reformed resulting in more people suffering injury and even death. Reforms to employment law will deny people from claiming unfair dismissal, people who are ill, people with disabilities and people who are vulnerable will be forever branded as scroungers. They will face the grim reaper in the form of cabinet ministers wearing the motley of Canio in Pagliacci and will probably weep joke tears and squirt comedy flowers at the realisation of ultimate foolishness. Crocodile tears, however, are not enough. We were then treated to some cunning stunts performed by the Home and Justice secretaries. Smokey Ken Clarke pirouetted the stage with a very large plank known as the Human Rights Act but missed as the May Queen bent to tie the laces of her very expensive shoes. Unfortunately, she stood up too soon and was smacked firmly in the face with a half Bolivian cat. The gag was really funny, but will lead to Smokey Ken being forced to run away from the circus and join a respectable law practice. Mrs May will be allowed to continue telling lies. The grand finale was reserved for the Harlequin in chief, Dopey Dave. Having disclosed the contents of his act to the newspapers as a cue sheet for standing ovations from the faithful, a few phone calls from the editors of the Daily Mail, the Telegraph and the Times resulted in a major re-write of his speech. Paying off our credit card bills was not such a good idea after all as, and credit to them, middle England and this wretched government lives on credit. Delegates paying their hotel, drinks and meals bills with plastic would be horrified. There are rumours of a small group of Tories who bought a round of drinks costing £80 and then legged it leaving the young waitress, on minimum wage, to have her wage deducted for the Bacardi Breezers and Mojitos. We are clearly all in this together. Dopey Dave, however, addressed the issue of inequality in education but seemed happy to defend the rise in tuition fees and the certainty of students starting adult life saddled with, guess what, debt. When talking of young people, the camera tastefully cut away to the young lovelies carefully selected to sit on the front row or to the fragrant Samantha, surrounded by the only three or four black and brown faces in the hall. Dopey attempted to end his speech with Churchillian rhetoric encouraging us to “fight” for Britain. Well. sorry Dave, the only people I shall be fighting is you and your idiotic, destructive coalition. Printing money, throwing human and employment rights into the bin, targeting people with disabilities, evicting travellers and clamping down on trade unions seems oddly familiar. It is, of course, completely absurd to compare this Tory led coalition to the insanity of the Weimar Republic in 1932, but with the news from the CERN Large Hadron Collider that particles may have been observed moving faster than the speed of light, time travel may indeed be possible. Schrödinger’s cat and the moggy belonging to the mistress of Liberal Democrat John Hemming might yet live again. It is absurd to liken this government to the rise of evil in 1930`s Germany for one major reason. The difference is that Hitler was democratically elected with a massive popular vote. This coalition was not. Hand me the hammer and the flask of cyanide and then send in the clowns. Five months is a long time in politics, broadcasting and even football. Back in May, Aston Villa missed out on Europe, West Bromwich Albion languished in mid-table obscurity, Wolverhampton Wanderers only just survived and Walsall just about avoided relegation, unlike the unfortunate Birmingham City. It’s not such a funny old game. As the last football season lurched to its disappointing end, this humble blog attempted to draw attention to one woman’s battle against the might of the Murdoch empire. Pub landlady of the Red, White and Blue in Southsea, Karen Murphy decided that she was not going to be pushed around by BSkyB and the Football League. Having been sued for breach of copyright for daring to screen a football match in her pub, she took her case to the European Court of Justice and today has seen justice prevail. It would seem that media tycoons and dodgy football moguls do not own the intellectual copyright of 22 men kicking a pig’s bladder about. Back in May, who would have ever thought that by July, Andy Coulson, Neil Wallis and Rebekah Brooks would be under arrest and Murdoch’s flagship, the News of the World, would be scuppered and left as a wreck at the bottom of Portsmouth harbour. Rupert and the boy James still face some awkward questions regarding their probity and their understanding of what telling the truth means and it now seems that anything they touch is tarnished. Court rulings, however, mean nothing to a family that buys and sells governments and they will be back to give Mrs Murphy a good kicking. This whole affair is riddled with delicious irony. Oily Cameron and the half-wit Osborne have, this week, appointed themselves champions of small businesses and wish to forget the taking of the Murdoch shilling. One doubts that they will be nipping in to Karen`s pub for a swift half and a bit of congratulation. Euro-sceptics from both the right and left, after years of barking at the moon in outrage at EU law, are now strangely but mercifully silent given that Europe has defended the underdog. The men that run football, happy to appoint an England manager with a basic grasp of English that is more impressive than his tactical ability, will be furious that premiership games played and managed by men with names like Carlos, Arsene, Roberto and Didier will be watched throughout Europe. Club owners like the Glazers, Abramovich and Sheikh Mansour bin Zayed Al Nahyan will curse EU legislation as they see all that lovely BSkyB money disappearing down the necks of drinkers in the Red, White and Blue. The sweetest irony is, however, the fact that Mrs Murphy bought her de-coder from Greece. With most of northern Europe excreting breeze blocks over the Hellenic economy and the banks that caused the trouble in the first place about to close down an entire nation state, it only seems fair that Panathinaikos should be awarded an automatic place in the Champions League final. Most of their players are actually Greek, but the coaching staff is Portuguese. Ah yes, it might be best not to mention Portugal, or Spain, or Italy, or Ireland or, the way things are going, the United Kingdom. If the finance ministers of bailed out countries need any advice on economic strategy, procurement, fairness and value for money, they could start by asking a pub landlady from Portsmouth. Perhaps Osborne should nip in for a swift half after all.